Accepted in Chemical Physics Letters. 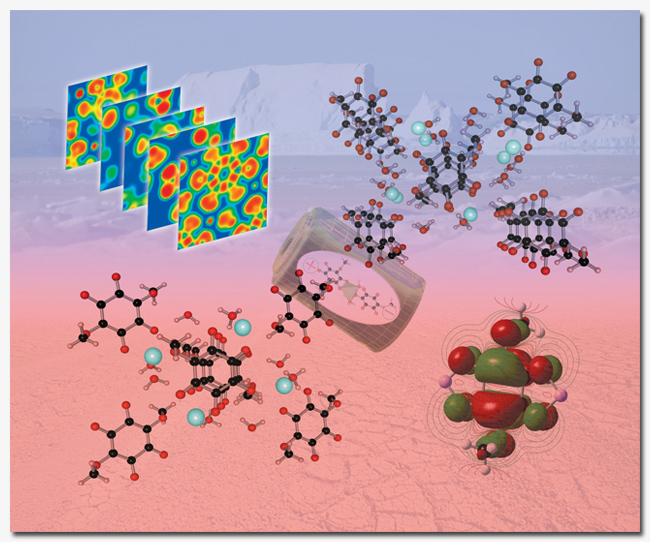 A solid-state density functional theory (DFT) follow-up to the solution-phase 2-pyridone (2PD) study published by Motley and Korter previously. Much of the work-up for this paper was straightforward, run-of-the-mill calculation and correlation (on the theory side, anyway). The most difficult part of the analysis was the identification of the easiest way to present the normal mode analysis of the 2PD crystal cell. A crystal unit cell containing M molecules with N atoms contains 3N-6M internal modes (those modes associated with intramolecular motions), 6M-3 external modes (those modes associated with relative motions between the M molecules, such as rotations and translations), and three acoustic modes. Some molecules simply do not absorb in the THz region, so all assignments are for external motions (and one simply identifies molecules sliding along axes or spinning around their centers of mass in their lattice site). Some molecules are very strongly bound to neighboring molecules in their lattice sites, which results in significant changes to the mode energies of low-lying vibrational modes (these are far more complicated systems to perform assignments of and a few of these cases are being prepared for future publications). Some molecules are strongly bound in very localized ways in their crystal cell to neighboring molecules and are very weakly bound to other neighbors in other ways. 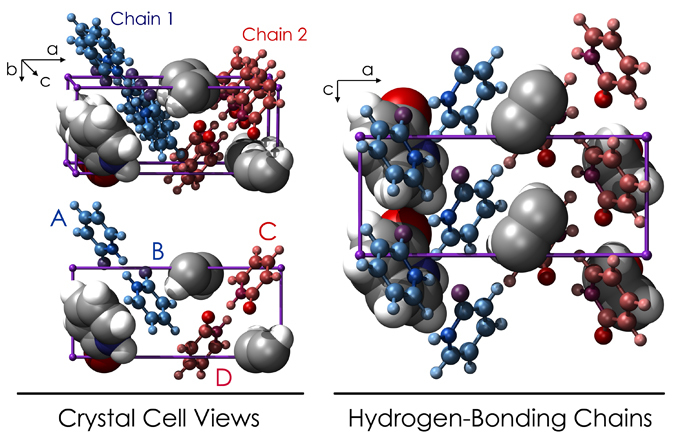 In 2PD, chains of molecules are strongly bound through hydrogen bonding along the crystal c-axis (see the figure below) and only weakly interacting between chains. In the figure below, the blue and red chains are strongly coupled in-chain (hydrogen-bonding) and only weakly coupled (dispersion and van der Waals forces) between chains. The assignment of the 2PD solid is simplified by two important facts. First, the two chains (red and blue) are related by symmetry (the unit cell contains two anti-parallel 2PD chains). Second, the chains are very weakly interacting. What point 1 means is that the chains, if in isolation, would undergo the same vibrational motions at the same energies (as if the chains were simply chiral molecules). What point 2 means is that these chains are, because they interact very weakly, approaching a limit where there can, in fact, be considered isolated chains so that the unit cell will contain vibrational motions that involve the two chains undergoing the same motion in-phase with respect to reach other (in-phase here meaning that, for instance, both of your lungs are expanding at the same time) and out-of-phase with respect each other (the hypothetical case where the left and right lobes are out-of-sync with one another). For instance, if both chains are sliding along the crystal c-axis in a vibrational mode, that makes the mode the in-phase acoustic translation in c (because the whole cell is sliding in one direction). If the two chains are sliding in opposite directions with respect to each other, this makes the mode the optical translation in c (the center of mass of the cell stays put while the chains undergo out-of-phase motions). This simplification for the 2PD assignment (and other solid-state molecular chains) turned out to be the mode assignment based on the treatment of not the in-cell contents of atoms and molecular fragments (if we kept ourselves to only viewing what is happening in the cell, for instance), but instead the relative motions of the chains, which requires ever-so-slightly thinking outside of the box. 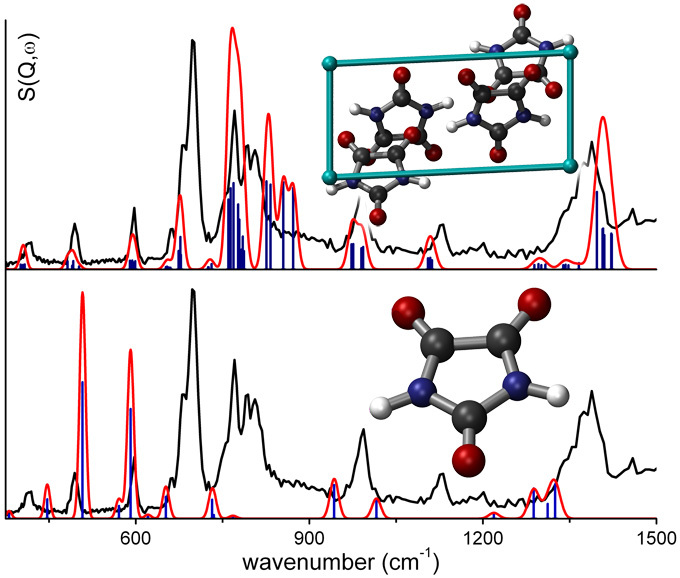 Crystalline 2-pyridone has been investigated using terahertz vibrational spectroscopy in the range of 10 to 90 cm-1 (0.3 to 2.7 THz). Solid-state density functional theory (B3LYP, BP, and PW91 with the 6-311G(d,p) basis set) was used to simulate and assign both observed terahertz spectral features and a previously published far-infrared spectrum up to 400 cm-1. The PW91 functional was found to provide the best combination of crystal structure and vibrational frequency reproduction. Observed spectral features below 150 cm-1 are assigned to intermolecular movements of the 2-pyridone chains within the unit cell. The use of independent intramolecular and intermolecular frequency scalars is proposed.